This document will provide you with a high-level overview of our product and service offerings. This document will provide you with a 1 page user guide to gaining access to our easy to use Admin Console. 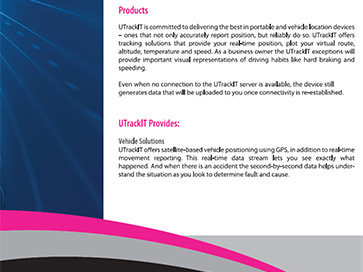 This document provides both a product and technical specification of our robust MobiGuard unit. 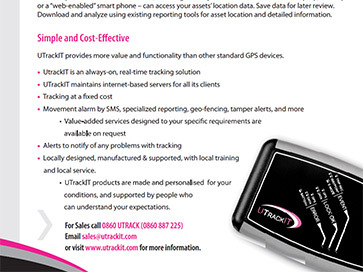 This document provides both a product and technical specification of our robust UTrackIT unit. A quick glimse into how our products work. 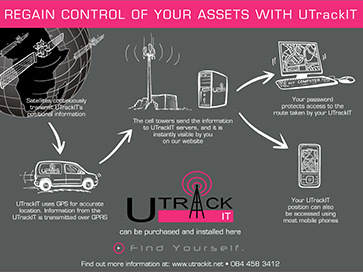 All UTrackIT devices use GPS (satellite) positioning to record location, and GPRS (cellular data) to transmit the information to internet-accessible servers. 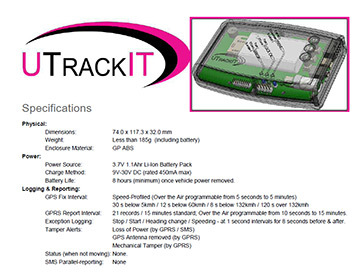 Pricing includes the cost of the tracking device and also the cost of the cellular connection and server infrastructure used to store and display the location data. 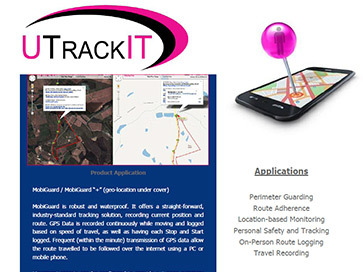 Current and past location data (journey / movement records) are accessible in real-time using an internet browser or smart device.